At the beginning of the university’s 50th year we launched this blog to celebrate the contribution of the University Archives and Art Collection to the academic and cultural life of the campus. Throughout 2017 we reflected on 50 years of collecting at the University of Stirling highlighting items from our art collection, special collections and university archives in our weekly posts. A huge thank you is due to everyone who contributed to our blog (Sarah, Rosie, Jane, Valerie, Helen and Ian). The selections of our curatorial team have highlighted the rich cultural heritage collected by the university since it opened in 1967. We have now reached our fiftieth and final post. 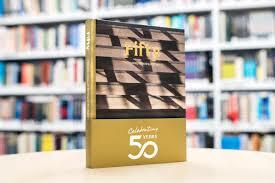 It seems appropriate to end with Fifty, a beautiful new publication produced by the university to celebrate its golden anniversary. Fifty tells the story of the university through 50 objects. It is a celebration of the people who have made the University what it is, with writers, academics, poets, alumni and students responding to objects that give a unique insight into Stirling’s journey. If you’re still looking for last minute xmas presents the book is available from the university shop. The book will provide a long-lasting memorial of a key year in the life of the university. We look forward to adding a special copy of the publication signed by all of its contributors to our collections.